CINCINNATI–A gene mutation that is believed to have safeguarded some people in 14th century Europe from the bubonic plague today may be protecting HIV patients co-infected with hepatitis C from potentially fatal liver scarring, says a University of Cincinnati (UC) College of Medicine physician-scientist. 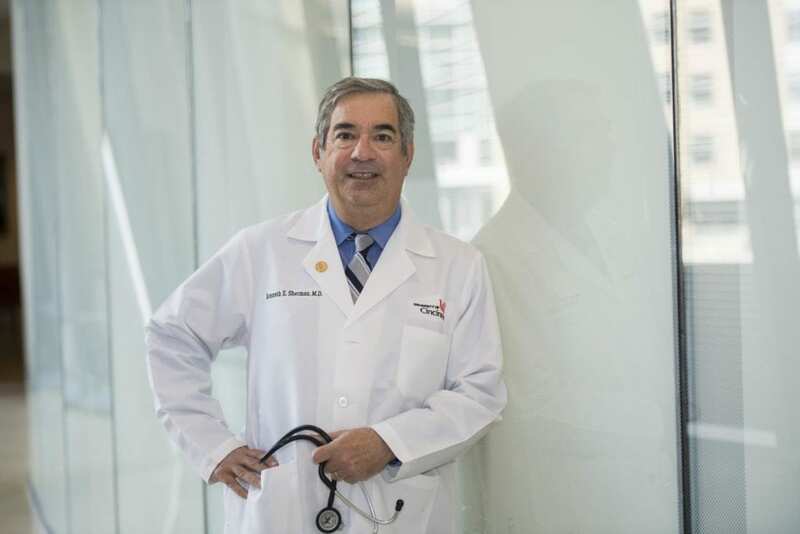 Kenneth Sherman, MD, PhD, director of the UC Division of Digestive Disease, led a team of scientists looking at how the CCR5-delta 32 gene mutation could protect HIV patients. The study’s results are available online in the journal Clinical Infectious Diseases. Sherman says he and a team of researchers from UC, the University of Maryland and the North Carolina-based Research Triangle Institute studied the blood samples of two cohorts of patients–one included individuals enrolled in the Multicenter Hemophilia Cohort Study, which included hemophilia patients who in the 1980s received untreated blood products contaminated with HIV and hepatitis C virus. “We identified within that cohort a group of patients for which there were serial samples collected over a period of four years on average and we classified those using biomarkers of fibrosis progression and whether or not they carry the mutation in CCR5 called the CCR5-Delta 32 mutation,” says Sherman. Previous studies have suggested that the CCR5-delta mutation was enriched in people of European descent and then passed down by the survivors of the Black Death which swept Europe in the 14th century killing up to a third of its population. It confers a survival advantage to those infected with HIV because HIV uses the CCR5 receptor to enter immune cells, explains Sherman. “Our belief was that this gene mutation would confer an advantage to individuals who have it in terms of their lowered risk of developing progressive liver fibrosis,” says Sherman. “We matched patients with and without the gene mutation and used measures of hepatic fibrosis that involved the use of a biomarker panel called the ELF Index (enhanced liver fibrosis). A second cohort of patients in the study included HIV patients who had no known liver disease and were enrolled in a clinical trial testing a new experimental drug called Cenicriviroc. It has the ability to block CCR5, a protein that is the main chemokine receptor on the body’s immune cells or T-cells, and is used by HIV to enter and kill those defenders of the body. Cenicriviroc could also block a second receptor known as CCR2. Patients in this trial were given the drug to see its effectiveness in battling HIV. Samples from the trial were utilized to determine the ELF Index. Patients with HIV who received a higher dose of Cenicriviroc showed a decrease in liver fibrosis (scarring) markers over a one-year period, explains Sherman. Liver scarring can cause life-threatening liver failure. He says this is important to know because in HIV patients many processes–not just viral processes– can lead to liver scarring. “If CCR5 and/or CCR2 lead to a decrease in fibrosis regardless of the source of it, we can prevent the consequences of liver injury,” says Sherman. “Medications that people take for HIV treatment sometimes cause fatty liver, and other forms of liver injury,” says Sherman. “Following infection with HIV, the gut bacteria leak into the circulation, a process known as bacterial translocation. One of the liver’s jobs is to clean bacterial toxins before they get to the rest of the body. Unfortunately, the liver itself is sometimes injured following exposure to bacterial breakdown products, causing injury and scarring. Other UC researchers participating in the study include: Enass Abdel-Hameed, MD, PhD, research associate in the Division of Digestive Diseases; Susan Rouster, principal research assistant in the Division of Digestive Diseases: Mohamed Tarek Shata, MD, PhD, associate professor in the Division of Digestive Diseases; Jason Blackard, PhD, associate professor in the Division of Digestive Diseases; Parham Safaie, MD, clinical instructor in the Department of Internal Medicine; and Paul Horn, PhD, professor in the Division of Pediatrics. Shyam Kottilil, MD, PhD, professor at the University of Maryland School of Medicine, is also a co-author of the study along with Barbara Kroner, PhD and Liliana Preiss, who are both researchers at RTI International in Research Triangle Park, NC. This work was supported by the National Institute of Allergy and Infectious Diseases of the National Institutes of Health under award number R01 AI065256-06-A1. Sherman has received grants and contracts paid to the institution from AbbVie, BMS, Gilead, Innovio, Intercept, MedImmune and Merck. He has served on the advisory boards for Abbott Labs, Gilead, Shionogi, Merck and MedImmune and on data safety monitoring board for MedPace and Watermark. Sherman also received support from Tobira (now Allergan). Kottilil reports grants from Gilead Sciences, grants from Merck and funding from American Gene Technology, during the conduct of the study. The other authors have no conflicts to report.